SightLine video processors are designed with a great deal of configuration flexibility allowing optimized integration in customer’s camera system. SightLine processors provide a great deal of configuration flexibility which allow them to be tailored to best meet each integrator’s system requirements. The big decisions our customers must make starts with the hardware, then software, and finally system interfaces. Two options, 1500 and 3000. System requirements will dictate which hardware is best for your application (size, weight,power, full-HD, Multi vs single-channel). Customers select only the processing feature set they want and do not have to pay for other features. See Application Bits section on this page for more information. 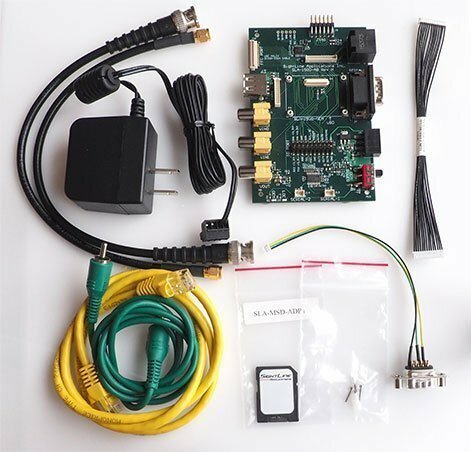 Camera Interfaces: A wide range of cameras are supported and hardware interface kits are available to facilitate these connections. See the Camera Compatibility Document for a list of cameras. The SightLine software design utilizes a license key file to turn on a specific set of software features. We call the license file function enable bits application bits or app bits. App bits are presented as a four-character Hex value (ex 0x0257). This allows customers to select (and purchase) only the processing feature set they need. Pricing Tiers are defined based on combinations of functions. – This creates the option of the lower price point SLE pricing tier when gimbal controls are not needed. – Similarly, it allows for the lower price point Tracker-Only options. The Tracker-Only can be integrated where tracking is needed but other features can be limited. – The price list shows each application bit and their associated unit costs. Price list available upon request. It is easy to upgrade a license to include additional features. – Customers can purchase an upgraded license file and send it to the 1500 or 3000 via the IP interface. This provides flexibility for customers to create custom configurations and sell feature upgrades. – See the License Upgrade Overview for more information. Download a software function to application bit hex code converter.